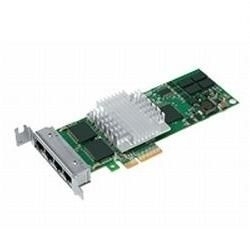 Conserve valuable PCI Express (PCIe) server slots while adding multi-port Gigabit Ethernet capability with the Intel PRO/1000 PT Quad Port LP Server Adapter. The dedicated input/output (I/O) bandwidth of PCIe ensures priority performance on each port, without bus sharing, for Gigabit Ethernet connectivity in Category-5 networks. The Intel PRO/1000 PT Quad Port LP Server Adapter improves performance in multi-processor systems by balancing network loads across multiple central processing units (CPUs). Additionally, the Intel PRO/1000 PT Quad Port LP Server Adapter supports Intel I/O Acceleration Technology (Intel I/OAT) for faster I/O processing on the new Quad-Core and Dual-Core Intel Xeon processor-based servers.